Jew wanna shawarma?? 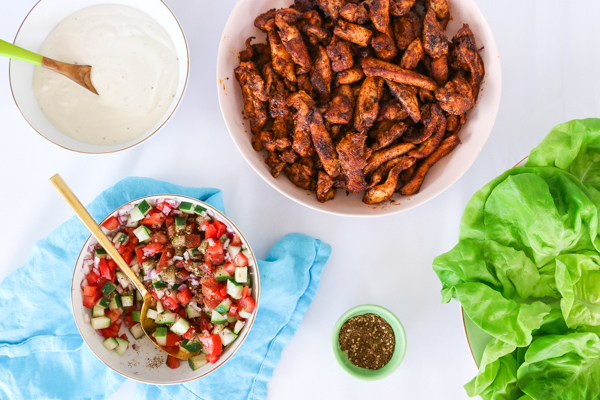 These chicken shawarma lettuce wraps are easy, tasty and healthy. What are you waiting for? I have never been one to make January resolutions. For a few years I would pick a word to focus on for the year, but now it feels like everyone does that and it’s become a little cliche and I always forgot the word by mid-January anyway. I always just focus on the moment, do the best I can, and, maybe most importantly, switch things up if I’m not happy. I have no qualms about changing jobs, cities or routines, and always trust my gut. We have some monetary and other goals for ModernTribe, and projects I am working on and want to work on, but in general I think if you work hard at something you love and put yourself in new experiences, or switch things up when you feel stuck, things will happen beyond what you could have planned for in a fancy designer planner with fancy color pens (though I love those too). I never planned to have this blog or a Judaica store or move to Puerto Rico with the best boyfriend in the world (he is currently figuring out how we can stream The Bachelor here in PR <3), but here I am, happier than I ever dreamed too. You’d be surprised where you end up when you focus on enjoying, being kind to yourself and just living. So it probably comes to no surprise to you that I never have diet resolutions either. My diet philosophy is to eat what feels good (that’s usually veggies, meat, eggs, yogurt, nuts), never deprive myself of homemade sweets, and mostly, just not to think about it and be in the moment and you’ll probably end up losing weight anyway because you are so busy living instead of trying not to each a chocolate chip cookie. 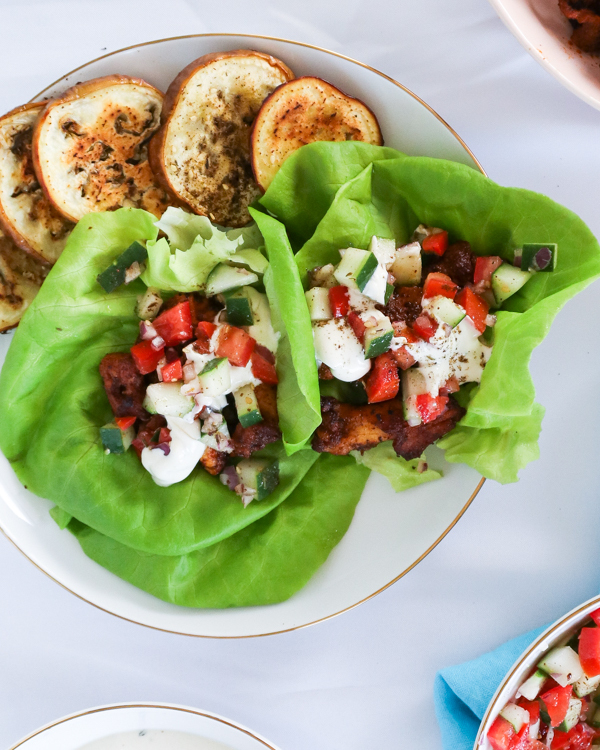 So whether you are eating a little healthier or just want to eat something delicious, these chicken shawarma lettuce wraps are it. The chicken is awesome on its own, with tons of spices and a nice char. Paired with tahini cream sauce and Israeli salad and, well, just try not to lick your screen. Feel free to double the chicken and eat some over salad or in tacos or in these chicken shawarma stuffed peppers! 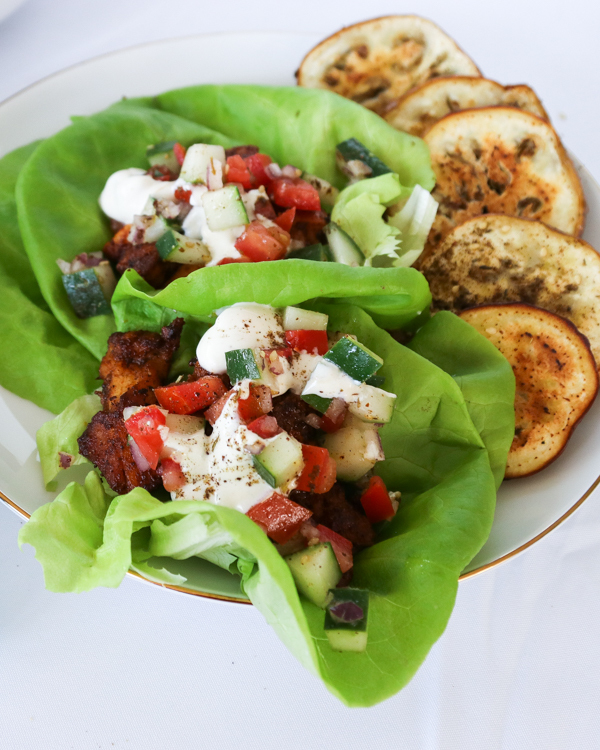 This chicken has become one of our staples and we eat it probably twice a month! I may just make it again tomorrow. 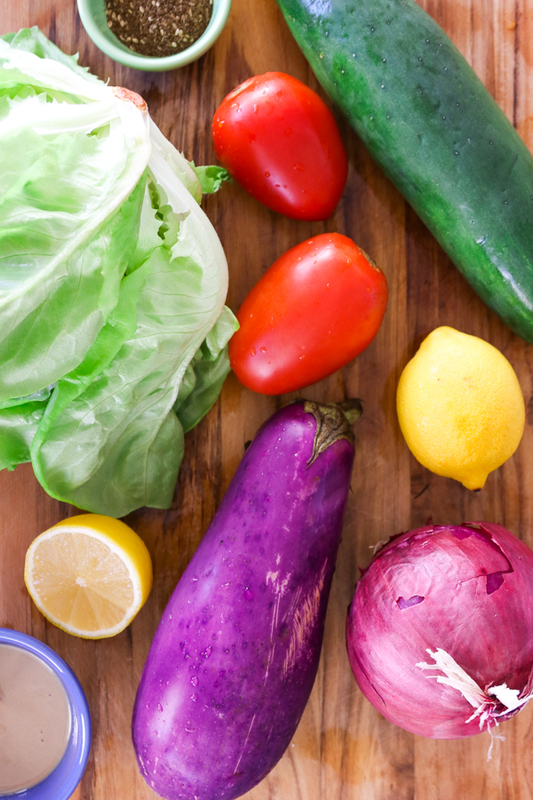 What are your favorite meal staples? Tell me everything! 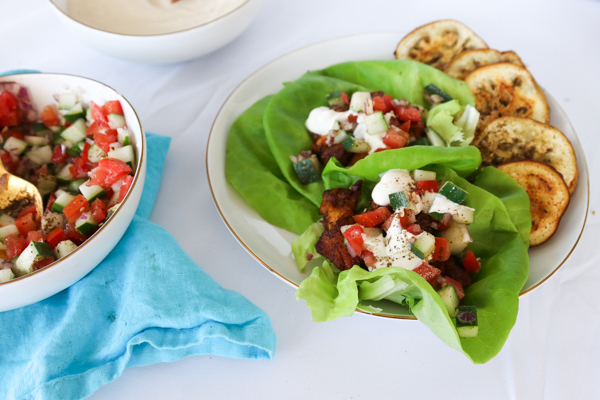 A gluten free twist on the best Middle Eastern sandwich! First, combine all the chicken spices together in a small bowl. 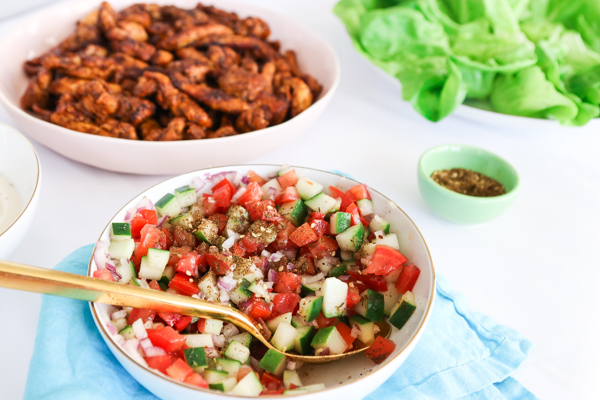 Place chopped chicken in a large bowl and toss with 1 tablespoon olive oil and juice from ½ lemon. Add in shawarma seasonings and toss to coat. 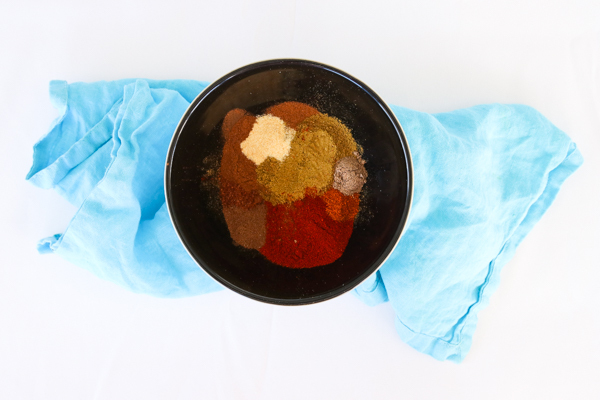 You can use it right away or marinate for up to 1 day for even more flavor. 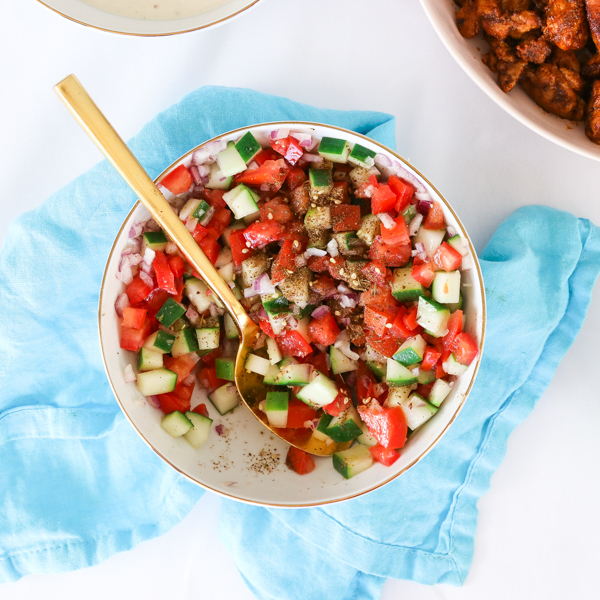 To make the Israeli salad, toss together all the ingredients in a medium bowl except the za'atar. Sprinkle on za'atar right before serving. This is best the day it's made. 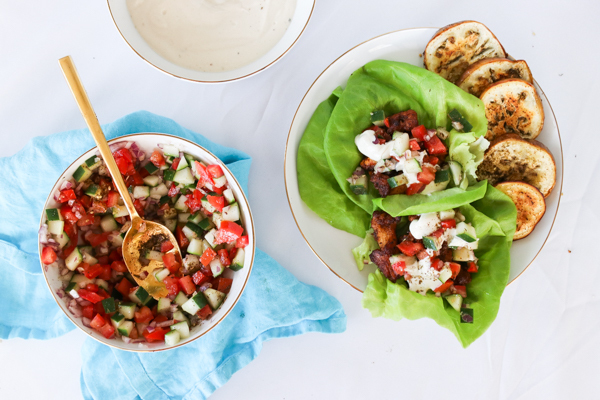 To make the creamy tahini sauce, mix together all ingredients in a medium bowl and add enough water to get a thick but runny texture. Feel free to double this and use extra on veggies, salmon, etc. When ready to cook the chicken, heat 2 tablespoons extra virgin olive oil in a large pan over medium-high heat. Fry the chicken in batches- careful not to crowd the pan, you want to be able to get the chicken nice and crispy. 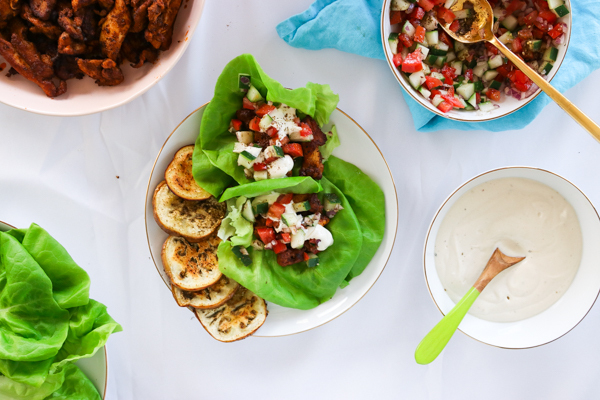 Drizzle cooked chicken with remaining lemon juice and serve immediately in lettuce, with eggplant, Israeli salad, and tahini cream sauce. The recipe looks good but it is the middle of winter and this recipe is full of summer vegetables. I think you should consider that when you choose recipes to feature. We do not want to continue encouraging the flying/shipping of vegetables from one climate to another at the expense of our atmosphere.